The Search for Auriga adds new heroes and features to the Endless Space: Disharmony expansion pack. A fifth free DLC pack has been announced by publisher Iceberg Interactive for its 4X spacefaring game Endless Space. Titled The Search for Auriga, the extra content will include new heroes, a special wonder, a unique planet and features such as Rally Points and balance tweaks to to the AI, according to Iceberg's press release. The expansion is due in November, with more details arriving soon, the company said. The only catch is that the coming DLC will require the Endless Space: Disharmony expansion, which was released earlier this year. 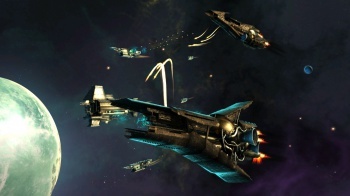 Developer Amplitude Studios have regularly supported Endless Space with free DLC since it's July 2012 launch. The previous four free content packs brought new factions, heroes, buildings and other features to the game.